Hi everyone! 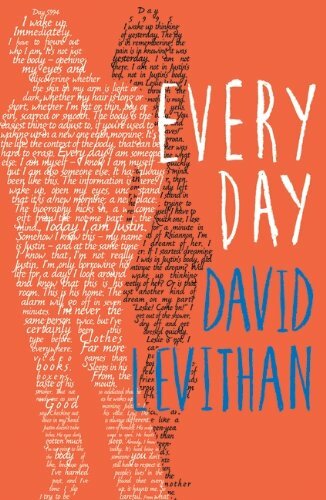 So, recently I read the extremely popular YA fiction book Every Day by David Levithan. The book follows ‘A’ who, every morning, wakes up in a different body. Then one day he is in the body of a boy named Justin, and he just so happens to feel a strong connection to Justin’s girlfriend Rhiannon and begins to desperately yearn to be in her life every day. I enjoyed this book enough to give it a 3.5 stars rating but for some reason I didn’t love it as much as everyone else seems to or as much as I thought I would. This being the case, I don’t feel like I have enough fully-formed thoughts or opinions on this novel to write a review as I normally would so I have decided to start a series on this blog called ‘Book Discussion’ (this is a really lame title for the series so if anyone has a more fun suggestion, please let me know in the comments!). So, how it will work is that if I read a book and don’t feel that I can or want to write a review on it, I will put up a Book Discussion post about it and we can all have a chat about our opinions in the comments (or feel free to do your own discussion post on it). As for the actual post, I will add the details of the book as I would normally do in a review then I will put some questions for us to discuss in the comments. So I hope that you are all on board with this new series and that you‘ll all get involved! Now, onto the first post! Did you feel emotionally connected and invested in the main character? There were times when I did feel that I connected with A and I certainly sympathised with his situation but for the most part I just wasn’t emotionally invested. How did you feel about the writing style? I enjoyed that the author was quite descriptive about the body that A was in each day as this kept it interesting, also there were moments when the writing was quite beautiful. The only issue that I had with the writing style was that, at points, it was very clear that the author was pushing his own opinions and it felt a little unnecessary and aggressive. Did you like/agree with the ending? I really enjoyed the ending and I thought it was the right thing to do, even though it was quite sad. How did you feel about the character or Rhiannon? I liked Rhiannon more than I liked A, she thought about how A’s actions were affecting the people whose bodies he was inhabiting while still managing to be a really good friend and support for A. I thought that her character was very well written and realistic. What are your thoughts on the situation with Nathan and Reverend Poole? Although this added some drama to the plot so that it wasn’t all about the relationship between A and Rhiannon, I thought that it was written in a way that was quite judgemental so I feel very conflicted about this element of the plot. So those are the questions and a little of my opinion of the book, please add your own in the comments and answer the questions if you wish! I look forward to chatting with you all! Note: Thank you to Eilidh for lending me this book to read! I bet like the concept of the story, maybe the writer couldn’t take it where he envisaged? Yeah, the concept was great but the delivery let it down a little for me. I like reader ramblings, thanks!